The Muslim Brotherhood has until Saturday afternoon to sign up to political reconciliation, said statement on a military-linked website Thursday, on the eve of pro-army rallies. “We will not initiate any move, but will definitely react harshly against any calls for violence or black terrorism from Brotherhood leaders or their supporters. We pledge to protect peaceful protesters regardless of their affiliation,” Reuters reported the statement as saying. The statement appeared on an unofficial Facebook account with ties to the top council of military generals. After the ouster of President Mohammed Mursi, a Brotherhood politician, on July 3, the installed an interim administration has set out a roadmap for a new political transition leading to parliamentary elections in about six months. Meanwhile, the White House on Thursday urged the Egyptian military to exercise “maximum restraint” and to do its utmost to prevent clashes between rival protesters. “The administration has urged the security forces to exercise maximum restraint and caution,” White House spokesman Josh Earnest told reporters aboard Air Force One as President Barack Obama headed for Florida. 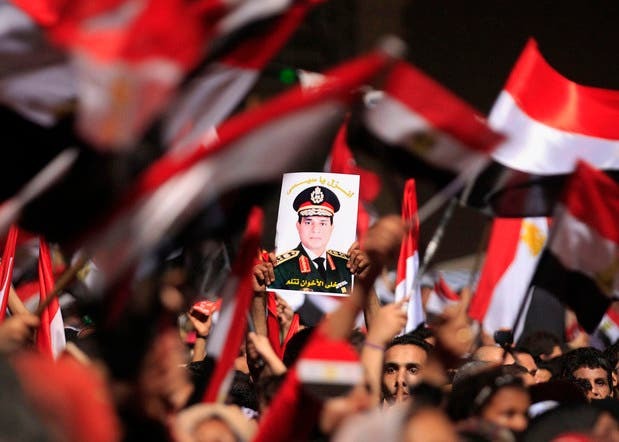 Earnest said Washington was concerned about “any rhetoric that inflames tension” after Egyptian army chief General Abdel Fattah al-Sisi called on Egyptians to take to the streets to show their support. Mursi supporters and the army that toppled him prepared for rival protests on Friday.